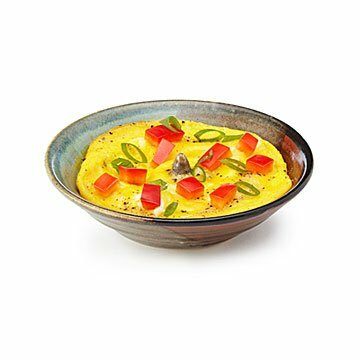 Step up your breakfast game and make a hearty omelet in 45 seconds with this stoneware clay dish. You love a veggie omelet in the morning, but stovetop cooking can be a little much when you're still half asleep--and a hurried pre-work routine leaves little time for culinary bravado. Step up your breakfast game and make a hearty omelet in 45 seconds with this stoneware clay dish. Just place the ingredients and dish in microwave, follow the included recipe, and you're well on your way to a well-balanced meal. Handmade by Tony Holman in Texas. Click here to learn how to use your 45 Second Omelet Maker. Tony Holman at the potter's wheel. Master Potter Tony Holman honed his pottery skills at Indiana University, going on to receive a Master of Fine Arts degree from the University of North Texas. He and his wife, Debbie, bought an old Victorian home in Texas to house their studio and gallery. The shapes of Tony's designs are both functional and decorative, and he pays close attention to the finishing touches. Because everything is hand crafted, no two pieces are exactly alike—lending beautiful variations of color, texture, and shape to each one. .I LOVE this product!!! In my freezer I keep a bag of chopped yellow, orange, and red bell peppers, a bag of grated cheese, and pre-cooked Jimmy Dean sausages. It is so fast and easy to put these together in the bottom of the omelet maker, pour the beaten egg over, and pop it in the microwave! I LOVE this Unique Dish and EVERYONE should have one! It works so easily and cleans up super fast! My husband and I like different types of omeletes. Using this omelet maker it is so easy to make our omelettes in the morning. Double the time if using two eggs. I wanted to try to eat more eggs in the morning but they take a while to cook. This makes it a lot easier! Plus is that it's adorable. If you want to do two eggs, double the time. This product is perfect for breakfast on the go! My husband and I strive to eat healthy meals daily. Breakfast has always been a struggle during our busy work week. Who has time to whip up a delicious, healthy breakfast? So we usually ate cereal. With a little advanced prep (dicing and sautÃ©ing some veggies) we really do have breakfast in 45 seconds. One omelet on an English muffin, bagel or slice of toast hits the spot and keeps us fueled until lunch! I wish I had one of these years ago! I was curious, well... it did exactly what it said it would. I made a ham & cheese omelet and it was delicious! Very happy with it! Really handy and you can customize your own omelet!